Nail houses is a name coined for residents who refuse to leave in order to make way for new construction. The Edith Macefield house is undoubtedly one of the most famous nail houses on the west coast. In 2009, Disney brought even more attention to the home by tying balloons to the roof of the house as a publicity measure for its 2009 film Up. 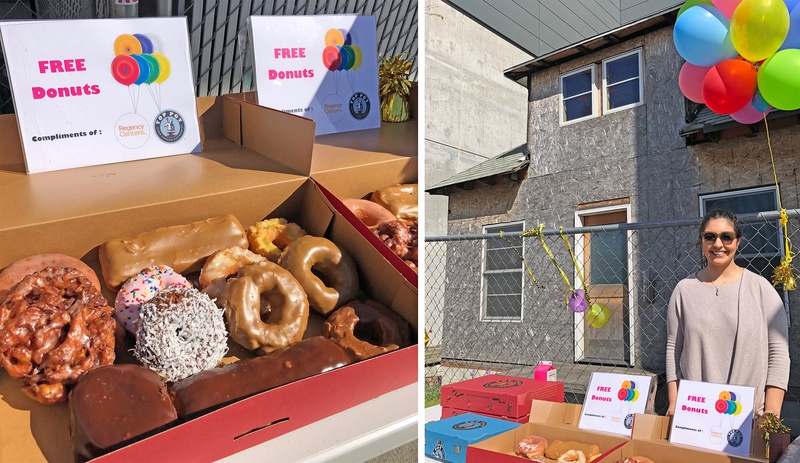 As owner of Ballard Blocks, Regency Centers received word of the rumors that plans were in place to demolish the more than 100-year-old home and immediately took action by helping to host an event to prove our intention to preserve the historical landmark. "The event really highlighted how symbolic the house is to locals and what is represents," said Neda Mahdavian, Senior Property Manager. "To the Ballard community, it’s a symbol of stalwart resistance and fighting for what you believe in. For Regency to be onboard with this movement reiterates how much we value community engagement at our centers and ultimately do what is right — one of our core values." Approximately 400 community members came out to tie balloons on the fence in front of the house, symbolizing its continued inclusion as a piece of history at Ballard Blocks. Complimentary coffee and donuts from merchant Top Pot Doughnuts were served. Media outlets and press including the Seattle Times, Kiro News, My Ballard blog, and Q13 Fox News were in attendance. Several ideas are on the table as for what to do with the house, but the celebration was a step in the right direction by connecting with the community. The Macefield home is a unique piece of history and Regency Centers is excited to have it remain part of the Ballard Blocks shopping experience.